Dog sledding is a tradition from the earliest human times in Alaska and the quintessential way to experience winter in the Alaskan Interior. Join us in the heart of the mountains where you will experience the profound quiet of wilderness, the thrill of running a dog team, and the awe of watching the Northern Lights dance above the snowy peaks. We generally run this trip in March, a time time of deep fluffy snow and dazzlingly bright days. The grip of winter relaxes, and it is the perfect time to travel the frozen landscape. Our Alaskan huskies are big-hearted, hard working, friendly animals and their enthusiasm for the snowy landscape is contagious. 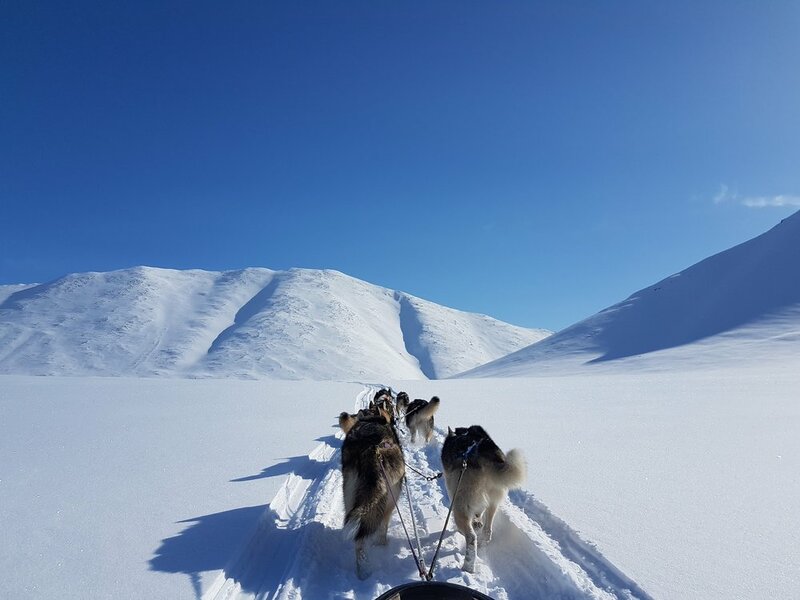 We will have a team of enthusiastic sled dogs and a tag sled setup, allowing you to learn to work with the dogs in a safe and controlled situation. 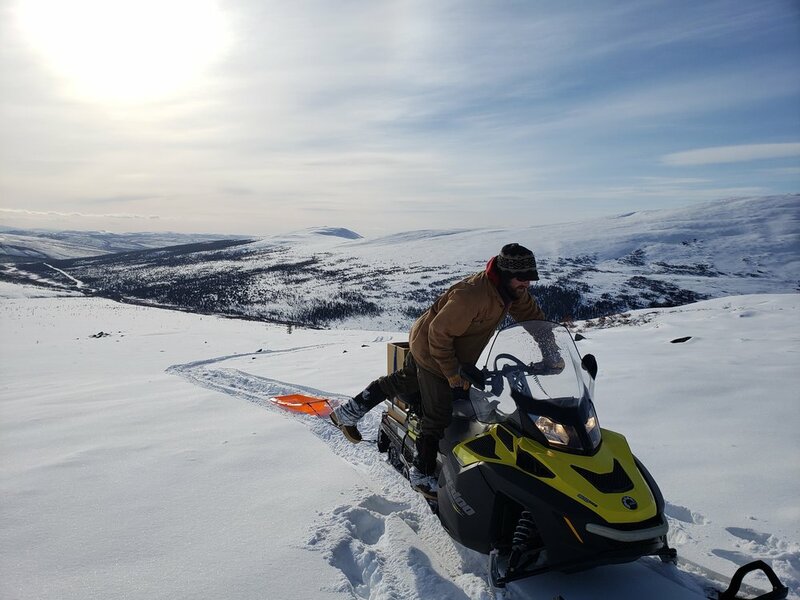 As you gain rapport with the dogs and sled handling skills, we can venture further and further from our camp on our daily forays. We are happy to teach you how to feed, harness, hook up, and care for the dogs. Wildlife is always unpredictable, but we will be on the look out for it. We’ll read stories in the snow from local snowshoe hares, caribou, moose, coyotes, wolves, lynx, marten, ptarmigan and more. It is common to wake up to a strutting ptarmigan or howling wolves. Day 1: The adventure begins. We’ll pick you up from your hotel bright and early and drive for a few hours, stopping to take in the view of where we’re headed. At the trailhead we’ll meet the dogs and go over mushing basics. After a quick lunch we’ll hit the trail, traveling by dogsled to our basecamp. The journey there will take 2-5 hours, depending on the location and end at a comfortable basecamp. Day 2-5: Each day brings its own adventure and surprises. Your desires and the weather will dictate the schedule. Wildlife sightings quicken the pulse and the process of learning to work with the dogs is immensely rewarding. Tents are kept warm and there is ample and delicious food. If you prefer to relax in camp and watch the snowy landscape from the comfort of a warm tent, enjoy! If you prefer to spend the whole day on the trail discovering one new vista after the next we are delighted to take you over the horizon. We’ll make warm fires and enjoy picnic lunches on the trail. You can also explore some different terrain on snowshoes or skis, learn more about natural history by following animal tracks with experienced guides, take some incredible pictures, and soak in the spring sun. If primitive skills interest you, we can work together on fire making, snow shelters and other bushcraft skills. When the day’s adventures are done we have excellent chances to see the Aurora dancing green and red above the mountains while the dogs howl in the twilight. Days 6: Our final morning in camp and time to say goodbye to the trails and vistas you have grown to love. Then it is back on the sled for the run back to the road. Kiss your favorite dog goodbye and then head back to Fairbanks for a well-deserved shower. We will set up a solid and comfortable camp sheltered from the wind in an area with abundant firewood. A large communal home made wall tent with a roaring fire and plenty of good food and drink provides a cozy oasis and serves as the kitchen/dining area/guide sleeping quarters. Our guests sleep in insulated “Arctic Oven” tents designed here in Fairbanks specifically for cold weather camping, each tent is outfitted with a wood stove. We provide 2 layers of sleeping pads, cots (if desired), and -40 degree sleeping bags. Included: Transportation from Fairbanks to and from camp, all food, all gear including tent, sleeping bag, sleeping pad, parka, snowpants, (bring your own if you like), boots, warm mitts, snowshoes. Not Included: Flights to Fairbanks, Alaska, lodging in Fairbanks for the night before you fly in and day you get back. Skis, boots, poles for optional cross-country skiing (you can rent skis from University of Alaska Fairbanks if you like). Bring your own alcohol if you like. Reserve your Adventure! After talking to us to confirm dates and details, please complete your reservation by paying a $500 down payment. This is fully refundable if you cancel at least two months before your trip's start date. Just click the "buy now" button and pay using paypal.